Hello there and thank you for stopping by today. Today is the fourth day of the MFT July Release Countdown. Only 2 days until the new release (yay)! Be sure to head over to the MFT Blog for full set and die reveals for the day. This release is packed full of gorgeous new products. 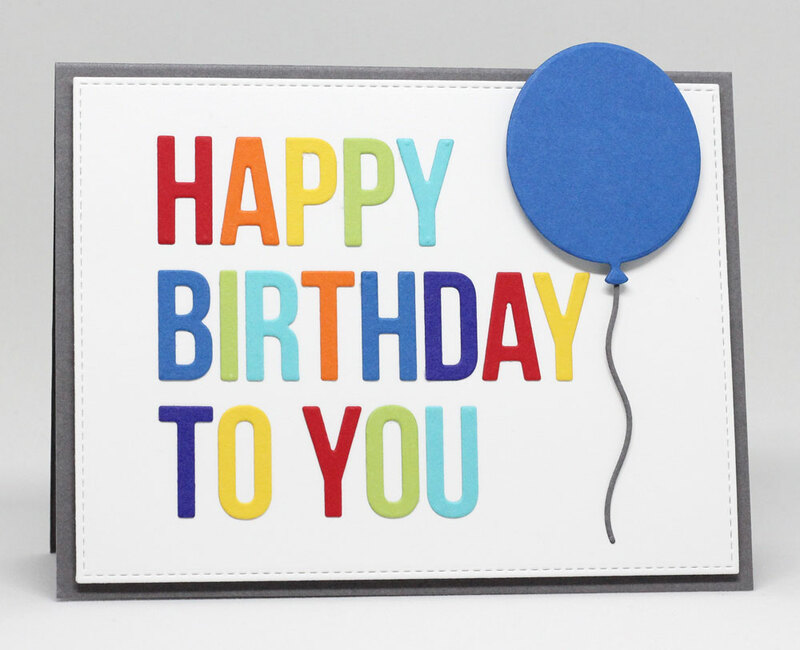 My card today features the new Happy Birthday to You Die-namics and Big Birthday Balloons Die-namics. I used the die cut negative to place the letters perfectly. I cut the die out of 7 different colors to create a rainbow effect with the letters. I rearranged the letters a million (ok, maybe 6) times until no colors were right next to one another and it looks balanced. A popped up balloon with string adhered finish off the design. These products and many more will be available for purchase in just 2 days, on July 5 at 10 PM EST. Be sure to check out the MFT Blog to see what the rest of the team has come up with today. This probably my favorite set so far. Love the font and I can think of so many ways to use it! Wow! Simply gorgeous- rainbows rule! Simple but amazing! Love it! The rainbow colours are stunning. Nice cheerful and colorful card. Very "happy" Who wouldn't love it? Nice. Thanks for sharing. Beautiful and fun woth rainbow colors. I had been seeing the Happy Birthday used in negative space so much I forgot it could be used this way as well. Thank you for that reminder. I like the bold colors and simplicity of the card. Makes me want to buy the product! What a great guy card! Love the colors, too. Cheerful and bright creation, love it!